SINGAPORE (Oct. 7, 2018) – Hideki Matsuyama is certainly one of the success stories of the Asia-Pacific Amateur, having won the event twice before going on to a successful professional career. On Sunday, another Japanese player followed in Matsuyama’s footsteps. Takumi Kanaya became the first Japan player to win the event since Matsuyama's two titles in 2010 and 2011. The 20-year-old Kanaya, who was the highest-ranked Japanese player in the field, has earned an invitation to the Masters and an exemption to the Open Championship. Kanaya started the day in third at Sentosa Golf Club, and was two shots off the pace set by defending champion Yuxin Lin of China. He had four birdies in his opening six holes on the way to a final-round 5-under 65 that got him to 13 under. Kanaya had been consistent all week, firing rounds of 69-69-64-65 for the victory. Interestingly, Matsuyama also won the second of his titles in Singapore, when the event was played at Singapore Country Club in 2011. Kanaya shares the same manager as Matsuyama. After the round, Matsuyama offered his young countryman words of congratulations by phone and said “looking forward to playing with you.” For Kanaya, like so many young golfers, the Masters has been a lifelong dream. Matsuyama has shown young Japanese players the way, and this week proved they are watching. “He's one of a few Japanese players playing internationally, so all of us amateurs are looking at him and dreaming and training hard so that we can be just like Hideki in the future,” Kanaya said. Kanaya made his Asia-Pacific debut two years ago in 2016 and opened with three consecutive rounds of 70, then had a final-round 82 to fall down the leaderboard to T-12. He began working with Japanese national coach Gareth Jones on strategies to better finish tournaments. 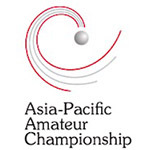 Already this year, Kanaya has finished third at the South of Australia Amateur, tied for fourth at the Asian Games (as Japan won the team title) and second individually at the World Amateur Team Championship. Kanaya wasn’t fazed by the suspension in play Sunday due to inclement weather. Following the hour delay, he came back with three consecutive birdies starting at No. 14. After a bogey on No. 17, he went on to finish on top of what had been a tight leaderboard throughout the day. India’s Rayham Thomas and Japan’s Keita Nakajima tied for second at 11 under. Thomas had impressive closing rounds of 64-65-66, but a 74 ultimately was the different maker in his run at the title. “One thing I definitely learned from this week is that you can’t win a championship of this level after starting with a four-over round,” said Thomas, who made only one bogey in his last 45 holes. Lloyd Jefferson Go, the Filipino player who hung around the top of the leaderboard all week, fired four rounds in the 60s (65-67-69-69), but it still left him three shots short and in fourth. Still, it’s the best finish for Go in six appearances at this championship. Two golfers with Pac-12 ties back in the U.S. finished fifth and sixth, respectively. Thai player K.K. Limbhasut, a redshirt senior at the University of California, also had four rounds in the 60s that left him 9 under. Past champion Cheng Jin, a Chinese player who is a junior at USC, was another shot behind that. Defending champion Yuxin Lin, the third-round leader, dropped to T-9 with a final-round 75.